Before the coming of the railway in the 1860's and the docks in the 1870's, Portishead was open to the tides of the Bristol Channel which brought the waters up to the White Lion and to the Parish Wharf opposite. Under the terms of the 1866 Portishead Pier and Railway Act, the two roods of land originally occupied by the Parish Wharf were exchanged for half an acre of land with a landing stage on the southwest side of the pill,close to the new railway line. 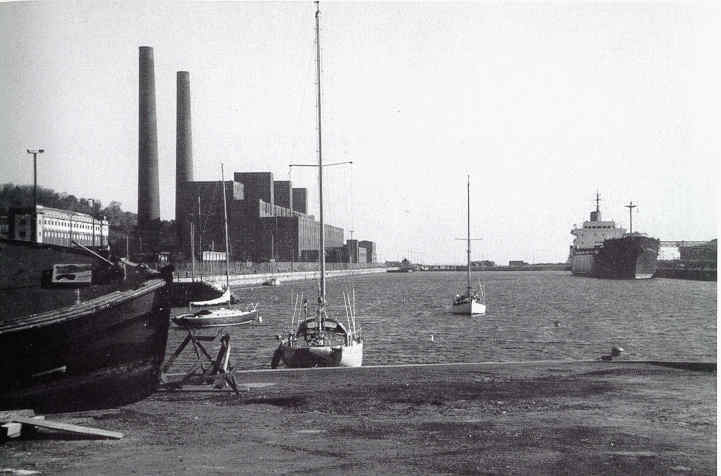 Parish Wharf about 1988 showing pleasure craft from Portishead Cruising Club the big ship on the right is the Albright Explorer', unloading phosphorous at the Albright and Wilson plant. Members of the Town Council are well aware of the situation and will have the matter under review, but the Committee felt that. If the residents of Portishead had details of the past history. Seeing how this matter is eventually resolved would be much more interesting. 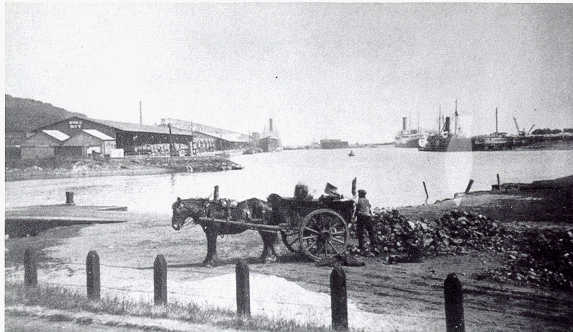 Prior to the build of the existing Portishead Docks opened in 1879, the original Parish Wharf was sited on the northwest side of what was then Portishead "PILL" (a local name peculiar to the Severn Estuary for a tidal creek on the coast). It was exchanged under the Portishead Pier and Railway Act of 1866 for half an acre of ground with landing stage on the south-west side of the present dock close to then new railway line Up to the 1939/45 War, this was freely used by ships (bringing in cargoes of sand, coals Etc) together with yachts of all sizes, and bathers etc. During the war the old wooden staging was pulled down: and replaced by a new Village Jetty" built of concrete and iron. Understandably at that time the jetty was enclosed within the Dock Area by the Ministry of War, Transport Barbed Wire and locked gates prevented free access to the public In 1947 action was taken against the port of Bristol Authority to regain the use of the wharf, this was dealt with by Coldstream Tucket, of Lawrence Tucketts Solicitors. Coldstream Tuckett took these proceedings on behalf of Dennis (Skip) Kealing who was appointed Commodore of Portishead Cruising Club for the purpose. Skip Kealing was chosen, as the plaintiff because he was a man of straw and legal aid was unheard of in those days he lived in an old boat at Pill on the river Avon. At all events proceedings were taken in the name of Kealing against the corporation. They were designed to restore public access to the Parish Wharf that had been closed during the war for security reasons The Corporation were ordered by the court to erect a new fence and gates in such a position that use of the Parish Wharf by the public could not be interfered with, The gates were to be locked at all times and until erection of the fences, members of the Portishead Cruising Club were to be given access. The Council was of the opinion that while the Port Of Bristol Authority could lawfully levy dues payable under statute in respect of the entry of Yachts and vessels into the dock they could not levy dues for lying up to the Wharf itself. In the statement to the claim he pleaded that the Wharf was and always had been a public open and lawful Wharf and had become so by immortal use. While the order (which was granted by consent) was limited to the question of access it did recognize that that the Public were entitled to use it and it is difficult to see how the Port Authority can now deny that.